Most stock golf carts come with what are called street tires. These street tires are 8” golf tires, and as their name suggests, they are great for driving along paved surfaces like asphalt. Street tires are smaller and use less power; however, they are not as versatile as a larger set of tires. A larger set of tires (for example, 10” or 12”) allows you to take rougher terrain, like rough trails and paths, due to the deeper tread. This gives you more ground to choose from and more options for you and your cart. Plus, don’t the larger tires just look cooler? Learn more about which type of tire is right for your golf cart here! Do you want to go into the spring with more power and more speed? It’s actually pretty simple to upgrade to a speedier cart. Upgrading your battery voltage from 36 (which is standard) to 48 is a great way to increase your speed. Upgrading your battery may also require a new Golf Cart Speed Controller which can handle the voltage, and which will allow you to go faster and give you more control over your acceleration. For even more speed, you can upgrade the golf cart engine. These upgrades don’t just increase speed but torque as well. Just be aware that in many states, it is illegal to drive a golf cart over 25 MPH on the street. Part of the fun of owning a golf cart is to take it for a ride during a nice evening or coming back from a nice dinner after hours. If you plan to drive your cart at night, consider LED lights for your cart. You can choose from a variety of kits and they give the underbody of the cart a cool, neon glow. The lights make you more visible and the ambient lighting helps you see as well. Other ways to make nighttime journeys more safe and fun are headlights, taillights as well as LED spot lights and LED light bars. (A light bar functions just like a long, rectangular spot light or head light and gives you more illumination.) Laws for driving your golf cart at night vary from county to county so be sure to check your local laws before taking your golf cart out for a night on the town. Just about the only thing better than driving around in your golf cart is driving around in your golf cart with a specialized cooler installed! Even better is the fact that there are as many cooler installations as there are choice in beverages. Because of limited seating space on the golf cart, the coolers have been ingeniously designed to fit in a variety of nooks and crannies on the golf cart. You can mount one to your dashboard or you can install one at the back of the cart via a hitch. Never ride thirsty again! Since most golf carts don’t come with extra rear seating, adding a rear seat kit is a great way to bring more people along for the ride. There are a variety of kits that make your cart a party-on-the-go. The extra seating looks great, allows for more passengers and also makes the cart more functional by flipping back to serve as a mini-flat bed. You can haul and carry just about anything like boxes, heavy equipment, gardening tools, wood or whatever project you are currently engaged with. 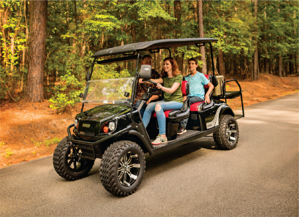 The stock golf cart is just the beginning of a customized and individualized vehicle that you can use both for work and play. Now is the time to get ready for the Spring! If you have any questions about golf cart customization, don't hesitate to give us a call or contact us online. We'd be happy to help you with any of your golf cart customization needs!